Situated at an altitude of 1225 metres above sea level at the base of the Stelvio Pass, Bormio is a small village situated in the Lombardy region of Italy, in the heart of the Alta Valtellina. Known as the Magnificient Land since ancient times thanks to its natural beauty, Bormio is still today one of the most attractive holiday destinations of the italian Alps. Here you can spend unforgettable ski weeks and enjoy the slopes where the Ski World Championships have been staged. 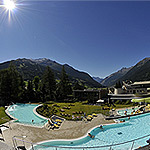 In summer Bormio turns into an ideal climatic resort surrounded by the unspoilt nature of the Stelvio National Park. Every season is good for relaxing in the hot waters of Bormio Spas: Bagni Vecchi Spa, Bagni Nuovi Resort and Bormio Terme. Walking through the town is also a very enjoyable experience, the historic centre still reflects the splendour of the village past. Old traditions and fine food make Bormio a unique place for your holidays in the alps; search hotels. 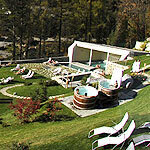 Holiday in Bormio: skiing, sports and spas in a historical setting!